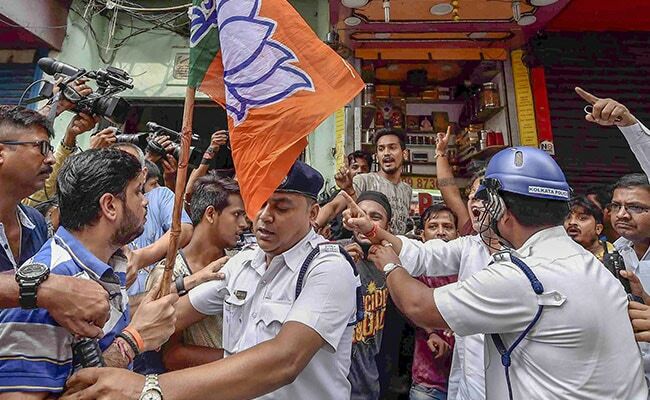 BJP workers clashed with Trinamool activists and fought pitched battles with police at some places during the shutdown, which the party claimed was a success due to "people's support" and called it off two hours ahead of schedule. Scattered incidents of violence, in which a shopkeeper was killed, marked the 12-hour bandh called by the BJP in West Bengal on Wednesday to protest the death of two students in North Dinajpur district. Torching of buses and clashes occurred in a few places and 1,600 people were arrested during the bandh. However, Chief Minister Mamata Banerjee described the shutdown as a "complete failure", saying the people of Bengal have rejected the "culture of shutdown and bandhs". A shopkeeper, Bibhuranjan Das, 45, died after miscreants fired at him from close range while he was opening his shop in Midnapore, police said. The incident happened at around 6 pm, well after the bandh was over at 4 pm. Alok Rajoria, West Midnapore Superintendent of Police, said Bibhuranjan Das was declared "brought dead" by doctors when he was taken to Midnapore Medical College and Hospital. "We are investigating the matter," Mr Rajoria said. Trinamool Congress working president Amulya Maity said Bibhuranjan Das was their worker and the BJP was behind his killing. The BJP, however, denied the claim. Normal life remained largely unaffected in the metropolis and the adjoining districts. But in North Dinajpur, the scene of the September 20 clash between the police and protesters in which the two students were killed, the shutdown made its impact. BJP supporters torched a state bus at Canning Street in central Kolkata, police said. Stone pelting incidents were reported from Shyambazar and Sealdah areas in the metropolis. Police said clashes broke out between supporters of ruling Trinamool Congress and BJP in West Midnapore, West Burdwan, South Dinajpur and North Dinajpur districts. The two students were killed when protesters clashed with the police on September 20 over recruitment of Urdu and Sanskrit teachers at Daribhita High School at Islampur in North Dinajpur district, the police had said. The protesting students had said they did not require Urdu and Sanskrit teachers and demanded that teachers be recruited for science and other subjects. Two state-run buses were set on fire and stones were pelted at vehicles at Islampur during the bandh Wednesday. Fire brigade personnel rushed to the spot and doused the flames, sources said. BJP workers squatted on the road at Islampur to stop traffic movement after which the police resorted to baton charge and fired tear gas shells to disperse them. Bandh supporters also blocked NH 34 in North Dinajpur. In this case too, the police resorted to baton charge to clear the blockade. ADGP (Law and Order) Anuj Sharma said that 1,600 people were arrested. There were a few cases of untoward incidents in north Bengal and Jhargram, he said, adding action would be taken against those found responsible for vandalising public properties under the West Bengal Maintenance of Public Order (Amendment) Act, 2017. He said attendance in government and private offices including IT firms, tea gardens and educational institutions was normal. Two buses were set on fire in Islampur and another in Jhargram, he said. Stones were thrown at buses and tyres were set afire on the road to stop the traffic in Midnapore district, a district police official said. A huge police contingent was rushed to the spot to bring the situation under control. In Malda, bandh supporters allegedly vandalised a panchayat office. A group of men, allegedly bandh supporters, intercepted and threatened the driver of a school bus carrying students of a public school on Jessore Road in the northern outskirts of the city. They threatened to damage the bus but relented on the requests of the teachers in it, sources in the airport police station, where a complaint was lodged, claimed. Education minister Partha Chatterjee had on Tuesday asked authorities of all schools, including privately run ones, to hold normal classes Wednesday and promised security if they faced any problem while ferrying students. Commercial establishments and private offices were also asked by him to function normally. The state government had issued a notification for its employees asking them to attend office on the bandh day. Transport services were normal in the state capital though bus drivers were seen wearing helmets. Train services were disrupted for some time at a few stations in the state under Eastern Railways and South Eastern Railways and 18 pairs of local trains were cancelled in Howrah-Kharagpur division, SER sources said. Chief Minister Mamata Banerjee, who is in Italy on an official tour, accused the BJP of trying to disturb peace during the shutdown and praised the state administration for "foiling attempts" to disrupt normal life. But BJP state president Dilip Ghosh blamed the TMC activists for the violence. "We believe in peaceful agitations. The strike has been more or less peaceful. In most of the places TMC has indulged in violence and blamed us. The people of this state have completely supported the strike call. Thousands of our supporters have been arrested by the police," Mr Ghosh claimed. The Calcutta High Court directed the West Bengal government to ensure that normal life is not hit in the state during the bandh and that action is taken against people indulging in violence.